Electric vehicles have been around since the invention of the automobile, but over 100 years later, they are now for the first time being more widely embraced by both automakers and buyers. 2018 saw an incredible 81% increase in electric vehicle purchases since 2017, with carmaker Tesla showing the world that there is much excitement and pent-up demand for well-designed #cleanercars. There are now over 1 million electric vehicles on U.S. roads, even though the technology was first re-introduced to the marketplace less than a decade ago. There are now over 40 types of electric vehicles on U.S. roads, including plug-in hybrids, up from just three vehicle models in the U.S. back in 2010. For the first time a single carmaker sold over 100,000 electric vehicles in a calendar year, and for the first time a single carmaker sold over 20,000 electric vehicles in a single month. Taking Tesla out of the equation for a moment, the car industry otherwise only saw an 11% increase in electric vehicle sales. But there’s some reason for optimism ahead in 2019, as more carmakers are finally rolling out more EV (electric vehicle) options. Jaguar, Mercedes and Audi are promising luxury vehicles to compete with Tesla, and more-affordable EV options are being rolled out in 2019 by carmakers Kia and Hyundai, and a new, longer-range LEAF from Nissan. Electric vehicles emit significantly less pollution than gasoline-powered vehicles, and they are also much easier and cheaper to maintain, which is part of the reason Consumer Reports is encouraging carmakers to offer more and better EV options for consumers. The strong improvement in new electric vehicle sales comes even as overall new vehicle sales in the U.S. more or less plateaued in 2018, and in spite of less-than-robust efforts of mainstream automakers to sell electric vehicles. Of the 40 EV models on the market in the U.S., most were not widely-available to consumers in 2018. Dealerships right now usually only sell EVs in states that require ZEV (zero emission vehicle) sales, such as California, and New York. According to data collected by Atlas Public Policy, the 10 states that required ZEV sales in 2018 accounted for about 62% of the sales of all-electric vehicles. It’s up to car companies and car dealerships to expand access. Survey data show that many people in other states are also interested in zero-emission vehicles, and consumers would be able to learn more about electric vehicles if they were available on more dealer lots across the country for drivers to see and experience for themselves. What’s more, even the market leaders in EVs could be doing more to provide more options. Chevy is only selling one electric vehicle, the Bolt. Nissan is only selling one electric vehicle, the LEAF. Toyota does not sell any all-electric vehicles in the U.S., only offering a hybrid called Prius Prime. 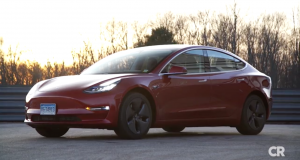 Meanwhile, Tesla offers both an all-electric sedan and an all-electric SUV/crossover, but it is still in the process of building up their capacity for output. Their long-promised $35,000 Model 3 is not yet widely available, and so they are not yet keeping up with demand. The most notable threat to improvements in this field is that regulators from the EPA and NHTSA are strongly considering rolling back the emissions standards for cars and light-duty vehicles that are set to go into effect in 2020. Those standards, which were collectively agreed to by both automakers and the federal government when they were adopted, require incremental improvements to fuel efficiency in vehicles. Independent analysis, by Consumer Reports as well as other independent academic outlets, shows that rolling back the 2020-20205 standards would have a broad negative impact on consumers, including saving fewer lives on the road, dampening the environment for job creation, and costing drivers more money on fuel and vehicle maintenance. The current administration is also considering a plan to eliminate the federal EV tax credit, which has been an important tool for expanding access to cleaner cars. Consumer Reports is in favor of reforming the federal tax credit to better serve middle class consumers, such as creating one big pool of tax credits (instead of a cap per automaker) as well as limiting the tax credit to electric vehicles within a limited price range. U.S. companies are competing in a global marketplace where major automakers from around the world, like Volkswagen and Honda, are investing heavily in electric vehicle technology. 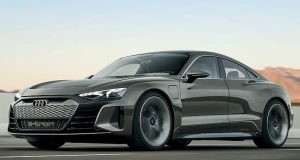 In 2019, Audi is joining Tesla as one of only a few automakers selling more than one all-electric model in America, as it will be selling both the Audi e-Tron and the VW e-Golf. 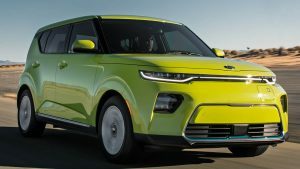 Kia will be offering both the Niro and Soul EV. Hyundai will be selling the IONIQ and the Kona. Finally, U.S. automakers announced plans to compete globally. Just days ago, Ford Motor Company announced a plan to more aggressively move towards electrification of their vehicle fleet in Europe, where emissions standards are more strict. It’s still unclear if and when Ford will provide consumers in the U.S. with an all-electric vehicle choice. General Motors also just announced they will be creating an all-electric Cadillac vehicle, a step that some analysts say is going to be the company’s attempt to compete with Tesla in the luxury sector. According to reports from Reuters and Axios, the first model, a Cadillac crossover utility, will debut in 2021, but might be focused on sales in China, Cadillac’s top-selling market. Eventually, Buick, GMC and Chevrolet will share the EV architecture, reports Axios. If you are thinking about buying an EV, check out Consumer Reports’ comprehensive guide to electric and hybrid vehicles. And if you are not sure if an EV can fit in your life, our quiz can help you understand if an EV is right for you. For more than 80 years, Consumer Reports has worked to help consumers make informed choices and influence the marketplace. Our research, journalism and media, and advocacy have led to safer products and fairer market practices. Consumer Reports is the world’s largest independent product-testing organization, with more than 50 labs, an auto test center, and a survey research center. The advocacy division of Consumer Reports directs our efforts to secure strong pro-consumer policies and practices in government and across industries. We have won important victories for consumers to ensure that the cars, food, and other products we buy are safe, raise the standards for financial services, and improve health and well-being.